Stone and siding combine with a shed dormer, creating a Craftsman look to this house plan exterior. 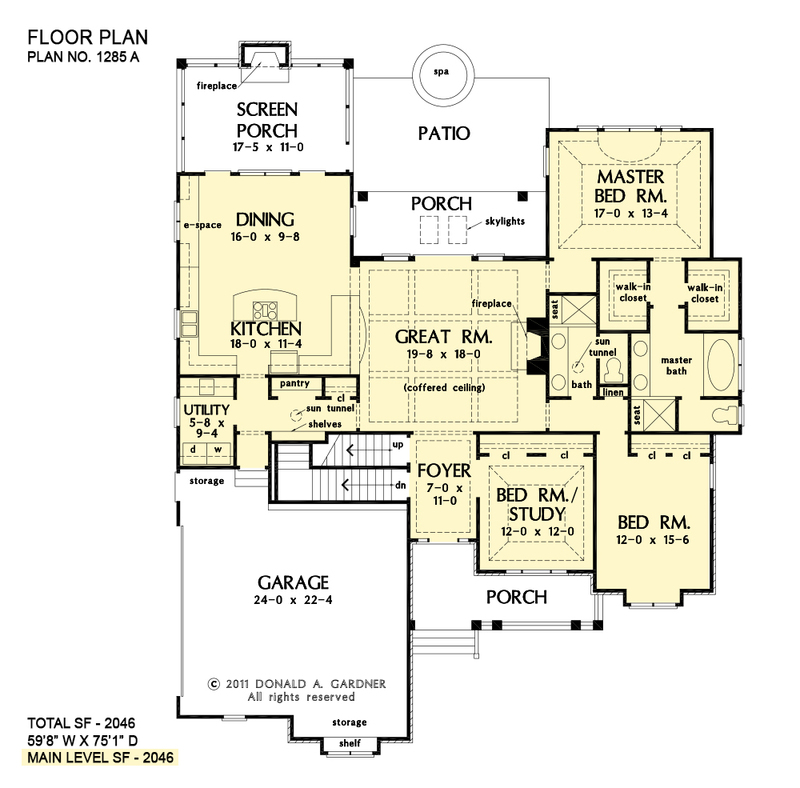 This three-bedroom design is perfect for growing families, with large, open living spaces, and many storage options found throughout this house plan. From the side-entry, oversized garage with extra storage space and shelves, to the built-in shelves and coat closet off the rear hall, families will have plenty of options to keep their home clutter-free and organized. The gourmet kitchen features a large island and is open to the dining room, which includes a convenient e-space that will be great for mom to oversee homework while getting dinner on the table. The luxurious master suite offers a tray ceiling in the bedroom, and dual walk-in closets that lead the way to the well-appointed master bath with dual sinks and a large tub. The outdoor living space abounds with a rear porch that leads to a large screen porch with fireplace and a patio with a spa. 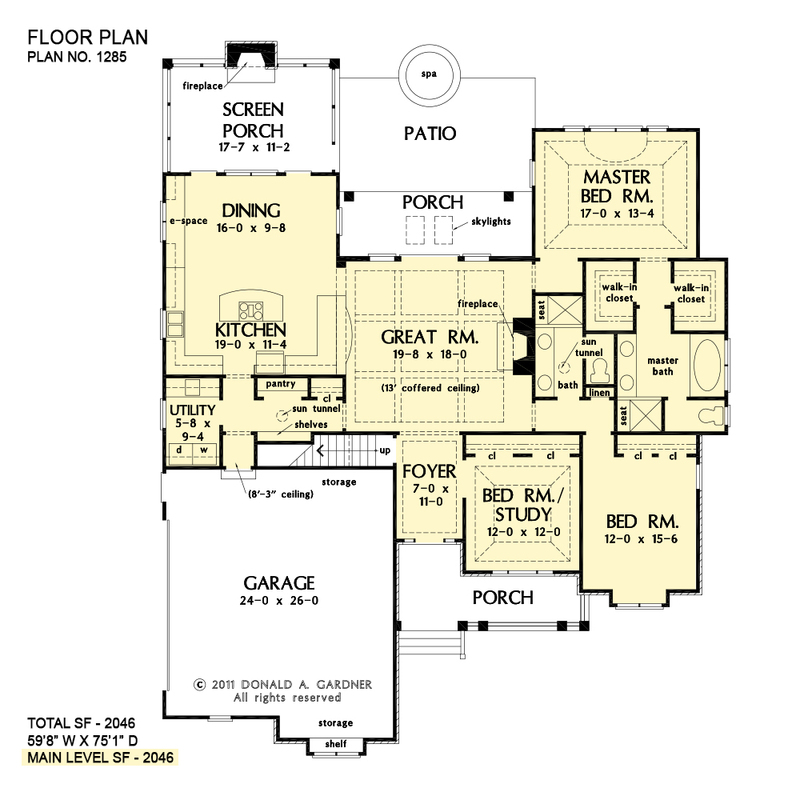 A large bonus space adds even more flexibility to this house plan. 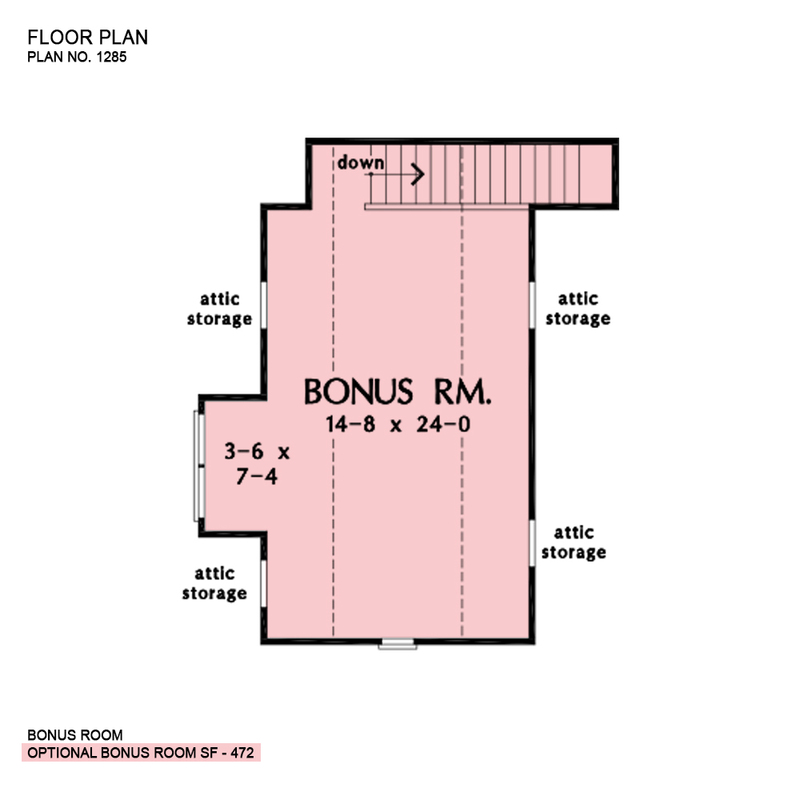 Bonus Room: 472 Sq. Ft.
Porch - Screened: 232 Sq. Ft.
Porch - Rear: 139 Sq. Ft.
House Dimensions: 59' 8" x 75' 1"
Great Room: 19' 8" x 18' 0"
Master Bedroom: 17' 0" x 13' 4"
Bedroom #3 : 12' 0" x 15' 6" x 9' 0"
Bedroom / Study (Tray): 12' 0" x 12' 0" x 10' 0"
Bonus Room : 14' 8" x 24' 0" x 8' 11"
Dining Room : 16' 0" x 9' 8" x 9' 0"
E-Space : 2' 0" x 10' 0" x 9' 0"
Foyer (Tray): 7' 0" x 11' 0" x 10' 0"
Garage Storage Bay : 12' 0" x 2' 4" x 0' 0"
Great Room (Coffered): 19' 8" x 18' 0" x 13' 0"
Kitchen : 19' 0" x 11' 4" x 9' 0"
Master Bedroom (Tray): 17' 0" x 13' 4" x 11' 1"
Porch - Rear : 20' 4" x 6' 10" x 12' 0"
Porch - Front : 20' 4" x 5' 10" x 9' 5"
Porch - Screen : 18' 8" x 12' 0" x 9' 0"
Utility Room : 5' 8" x 9' 4" x 9' 0"